All these plus an warm, sweet & fresh loaf of bread makes for a beautiful weekend brunch. The aroma of a freshly baked bread can make you so, so hungry!! 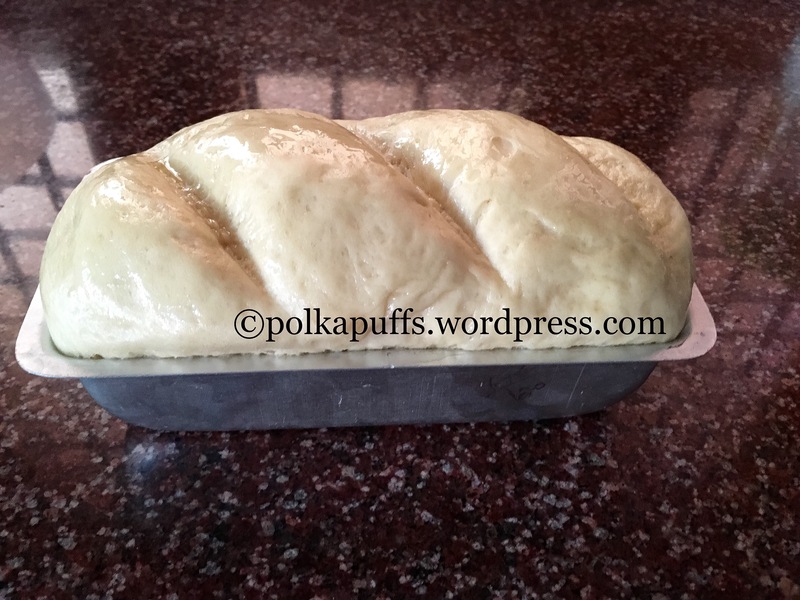 Yes…this loaf was baked by me for Sunday brunch…and was devoured by my hubby & me in about 15 mins! He, with some honey and me…jam! 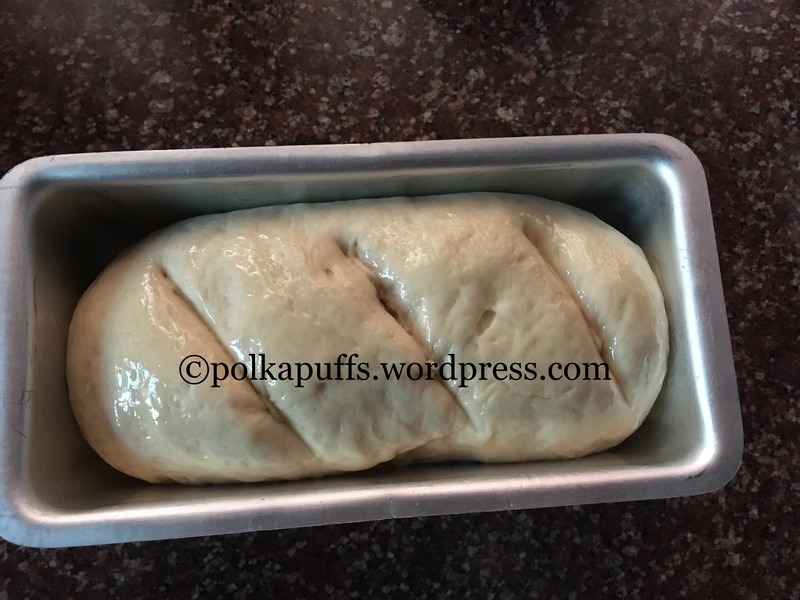 Perfectly moist and light loaf of bread was a dream for me when I started baking breads about more than a year ago..but I kept trying and it’s been a little over six months that I make good breads..though not wholewheat…not yet. I am yet to try those. The recipe that I use for this bread is the same as the one I use to make pizza base. It’s pretty easy, but do follow there simple steps to ensure a good loaf. They are all tried and tested by me. Always fluff the flour and add spoonfuls of it into the measuring cup then level it off with a knife. As simple as that. Measurement is crucial. I have used instant active yeast, never tried baking with fresh yeast. Check the box for the expiry date thoroughly before starting the recipe, make sure you don’t use the yeast if it’s less than two months away from the expiry date. If your yeast doesn’t bloom or activate, discard and start again. The water used for activating the yeast must be tepid. That is when you can comfortably hold your finger in the water but it must not be on the cooler side. Do not try to make this “healthy” by skimping on the fat/ oil/ butter content. Follow the recipe and you will have a moist loaf. Equipment: 1 large mixing bowl, a small bowl, measuring cups/ spoons, baking tin, cooling rack. Take warm water in a bowl, add the sugar and yeast to it. Cover it and leave to prove & froth for 10 mins in a warm place. Next, in a large mixing bowl, add the flour, 2 1/2 tbsp oil, salt to taste. Now add the entire proved yeast mixture & using a fork mix everything together to make a sticky dough. It will be very sticky but should not be falling apart at all. Now, sprinkle some flour on a work surface, and drop the dough on it,sprinkle some more flour over the dough. Using your palms, start kneading the dough well. Add more flour if the dough feels too sticky or some water if it feels very dry. Keep kneading well for 10 mins. You will have a neat, non-sticky ball of dough. Knead it for a couple of mins more. It should all look like this. Now, grease the mixing bowl which you have kept aside & place the dough in it, cover with a lid or cling film & set aside in a warm place for 1 1/2 hours to prove. It should be double or more than double in size after proving. It will look like this. Gently, punch the air out of the dough. Next, grease the baking tin with oil. Set that aside. Roll out the dough in an squarish shape and flatten it out a bit. Start rolling from one side like a Swiss roll. Pinch to close the ends. Keeping the pinched side down, place this roll into the greased tin. Make deep incisions using a serrated knife if you like. Cover loosely with a kitchen towel and place it in a warm place for 30 mins for second proving. This is how it should look after the second proving. Once done, remove from the oven and cool on a cooling rack for about 15 mins before slicing the loaf as it needs to set well. That’s it, your bread is ready. Keeps well for a day or two wrapped in a parchment paper in a bread box or any container. Pingback: McDonald’s Style Pizza McPuffs | Bakery Style Vegetable Puffs | Polka Puffs! Pingback: 3 Ingredients Mixed Berries Jam | No Pectin Jam Recipe | Berry Jam Recipe | Polka Puffs!